What is the Painted Desert? The Painted Desert is an expanse of badland hills, flat-topped mesas and buttes. It is an arid land, sparsely vegetated and heavily eroded. 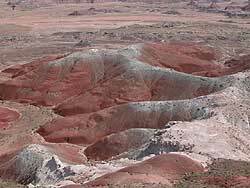 The name Painted Desert refers to the rainbow of colorful sedimentary layers exposed in the austere landscape. It is represented by outcroppings of the Late Triassic Period Chinle Formation. The Painted Desert is a narrow, crescent shaped arc, about 160 miles long which begins about 30 miles north of Cameron near Grand Canyon, and swings southeast just beyond Petrified Forest National Park. This arc varies in width from 10 miles wide in the Cameron area to about 35 miles wide at Petrified Forest. The Little Colorado River cradles the southern edge and the tableland of Hopi Mesas and buttes make up the northern boundary. The landforms of the Painted Desert have been described as a multicolored layer cake. The variety of hues in the sandstone and mudstone layers of the Chinle Formation is the result of the varying mineral content in the sediments and the rate at which the sediments were laid down. When sediments are deposited slowly, oxides of iron and (hematite) aluminum become concentrated in the soil. These concentrations create the red, orange, and pink colors you see at the north end of the park. During a rapid sediment buildup such as a flooding event, oxygen is removed from the soil forming the blue, gray, and lavender layers. You will see these colors as you travel through the southern portion of the park. Wind and rain, sedimentary composition of the rocks and the lack of protective vegetative, all contribute to rapid erosion of the Chinle Formation. Torrential rains of the Arizona monsoon hasten the erosion of the soft mudstone by cutting deep, narrow gullies into the steep slopes of the hills and the soft, rounded hilltops seem to melt as the soil is washed from the tops. As you drive through the park, you will notice that some of the clay hills have a layer of resistant sandstone, conglomerate or basalt on the top. These hills erode at a substantially decreased rate. Similarly, where well-developed vegetation grows, erosion is slowed. Erosion studies indicate that steep slopes may loose as much as 1/4 inch of soil a year. That small amount may seem insignificant, but geologically it is very rapid; each century one to two feet of surface material erodes away.